Red Thread Lawn Disease | Fairway Green Inc.
A closeup of red thread lawn disease. Lawn diseases are frustrating for every homeowner that desires to maintain the picture-perfect lawn and landscape. Unfortunately, the warmer temperatures of the spring-time that we all love; along with frequent rainy periods, creates the perfect storm of environmental conditions to be just right for fungus to grow in the lawn. A frequent spring-time lawn disease observed in many lawns is Red Thread Disease. Red Thread Disease is caused by the fungus Laetisaria fuciformis, and is most notable during the early spring months. The first observable symptoms of red thread lawn disease are tan-to-red thread like growths called sclerotia, often seen in patches of 4 to 6 inches in diameter. Two environmental conditions that are key components to the fungus growing are high levels of humidity and temperatures between 60 to 75; making the spring time optimal for the disease to spread. The sclerotia strands can protrude upward from the blade tip of the grass, making them noticeable among other patches of disease free, green grass. Although all varieties of turf grass are susceptible to red thread lawn disease; perennial ryegrass has been found to be the most susceptible, and fine fescues are also especially susceptible. Although the disease is unsightly, red thread lawn disease does not cause permanent injury to the grass. The key to controlling red thread lawn disease culturally is to promote turf growth. Maintaining adequate nitrogen and good soil moisture are the two most important factors when dealing with a red thread outbreak. This will not only help to grow out the disease but, also creates a stronger healthier lawn overall. As the new growth occurs, the disease portions are cut away, leaving the healthy turf underneath exposed. When red thread lawn disease has been a persistent issue, checking the soil pH level and maintaining a reading between 6.3 and 6.7 may help in reducing the issue. Also, the sclerotia survives in the thatch layer of the lawn. Heavy thatch build up and soil compaction can be reduced by core aeration, and we recommend this procedure is performed biennially in the late summer or early fall. 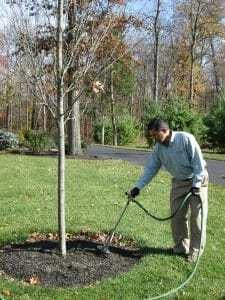 Additionally, it is important to practice watering techniques that will not overwater your lawn since the disease thrives under moist conditions. We recommend watering between midnight to 6 am and for those that have underground irrigation systems, run each zone for 1 hour twice a week. For traditional hose end sprinklers, run the sprinkler for 4 hours per area of coverage twice a week. For more information about watering your lawn, check out our blog. If optimal weather conditions persist for this fungus, it will continue to spread more rapidly than the grass can grow it off. In this case, it may take several weeks to over a month for complete recovery of the turf. While this fungus will not kill the lawn, it can be frustrating for homeowners to deal with this eye sore for weeks while it grows out. If red thread lawn disease is severe, a fungicide treatment can be applied to the lawn. Post application, the disease will not be able to actively spread for three to four weeks. 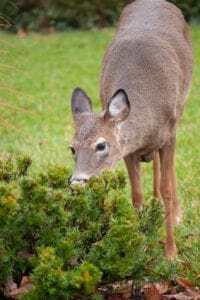 This allows the lawn time to grow out the infected grass blades more quickly than the disease can spread, and the fungus is gradually cut away with regular mowing. 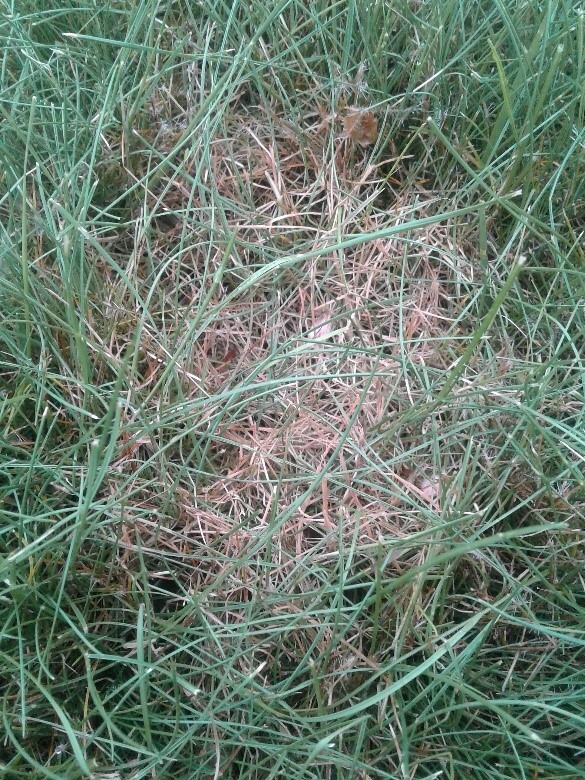 Red thread lawn disease is common; luckily it does not cause permanent damage on your lawn. Most red thread outbreaks can be kept under control through sound cultural practice, and the lawn can soon return to the green state it was prior. For especially bad cases, fungicide treatment is available to control the red thread lawn disease. If you have any questions about treating red thread lawn disease and you are in our service area, please give our office a call at 908-281-7888 or request an estimate.